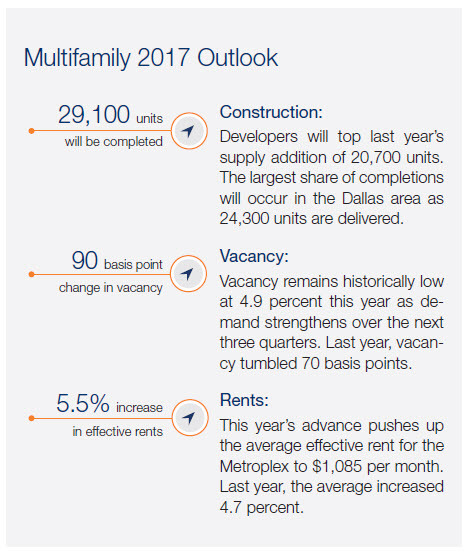 ​​​DALLAS – Employment gains of nearly 3 percent or more since 2012 have boosted local demand for both single-family and multifamily dwellings, says Marcus & Millichap in its latest multifamily market report. Single-family housing supply remains tight, pushing up home prices and keeping many would-be owners in apartments, the firm says. "Strong rental demand and absorption across the Metroplex have encouraged apartment development," according to the report. "The pace of apartment completions will reach a peak this year as builders are set to bring more units online in Dallas-Fort Worth than nearly every other major metro in the country. It is surpassed only by New York City."